I am a multi-instrumentalist from Texas, currently living in the Nashville area. I play fiddle, mandolin, guitar, ukulele, banjo, as well as some ethnic instruments such as Chinese Erhu and Japanese Shamisen. I have a small home studio where I provide overdubs for clients needing auxiliary tracks to round out a project. Guitars, Ukulele, 8 string uke (mandolele), Soprano Gutstring (Guilele), Tenor banjo, Bouzouki, Shamisen (三味線), Kokyu (胡弓), Erhu (ニ胡), Harmony vocals. I've had the pleasure of working with Kyle on several recording sessions and his talent and attitude are both absolutely top notch. If you are looking for someone to additional elements to your project Kyle is your guy. I look forward to the next time we get to work together. Kyle Aaron can play anything and his ear is extremely articulate. He's worked with a lot of big names in the industry, and he'll make you feel just as important. Another added bonus...Kyle has puns for days. A: When I was on tour with John Berry, I got a phone call on the road from one of my best friends, Erika Chambers, who I've done music with for almost a decade. Her sister Aly had been diagnosed with stage 4 colon cancer at the age of 26. Erika had this idea to help raise some money to help with the medical costs. 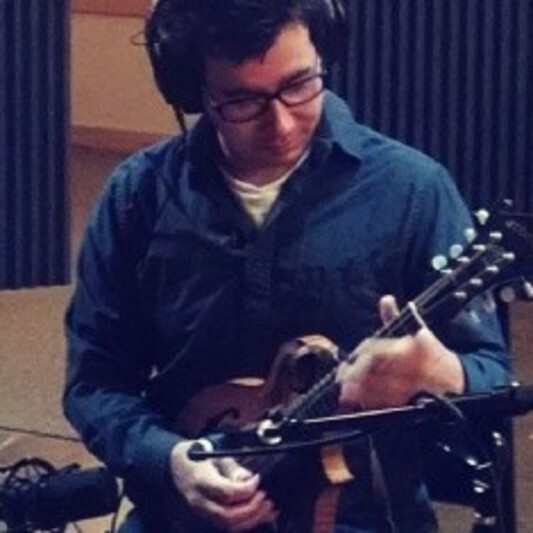 Erika's friend Jeremy McCoy had written a song called "Hope Won't Disappoint" and Erika wanted to record it and put it up online for donations to Aly's fund. The bus I was on happened to be on its way back to Nashville for two days off before the rest of our tour, so I told Erika I'd help. As soon as I got home, I recorded a guitar track and called Erika over to sing her part. With those two tracks, I spent the next day recording the rest of the instruments, arranging a string part, and mixing right up until the minute I had to leave for bus call. The recording was rushed, rough around the edges, not mastered, and I wished I'd had another day to be creative and really do it justice, but it was what it was, and Erika put it up online. Within a week, the song had raised nearly $3500, which was enough to cover Aly's hospital stay and pay her and her husband's bills for the month. That song never made it on a record, wasn't played on the radio, wasn't pitched to an artist and cut, wouldn't win any awards, and probably would get picked apart by producers and engineers for all of its mistakes, but it was my proudest moment as a recording musician. It's rare moments like that when I remember why I do what I do. A: Finishing up a record for a Texas Country band in Lubbock. A: Rachel Pearl. Because she has a super cool voice and I know about this site because of her. A: Digital. Because I'm a nerd and I'm good with computers. A: I get to play music. A: That I make money. A: A saw, an auger, a pitch ladle, a shipwright's adze, and a sail iron. Then I'd build a boat and sail home. A: My career path was always music. I started playing with bands when I was 14. I've been poor ever since. A: Always be humble. You end up with a more unique sounding production when you allow others to bring their ideas to the table. Even if that idea gets shot down or doesn't work, it never hurts to be open to someone else's creative process. A: By default, country, but these days I've transitioned more into Americana and folk (which is where the REAL country music is). I enjoy all genres, though, and I try to be a musical chameleon so my parts fit. A: A tasteful part that fits the style that isn't in the way of other stuff. A: Client sends a bounce with relevant info (bit/sample rate, tempo) I pop it into a new session, listen through a few times to familiarize and plan out parts (unless the client has specific ideas already), then I roll. When I'm happy with my parts, I edit down, make sure all of my crossfades work, tune things if they need it, bounce, and off it goes into DropBox. A: I've been doing "over the internet" collaborations since the days of Pro Tools 6 and the original MBox (circa 2003) when I was still in college. Actually, back then it was faster to burn a copy of my tracks on a Data CD and mail them off or take them by hand to my collaborators, and while that was a pain, I've never had to cut and splice tape, but I digress. My setup hasn't changed much since those days. I keep it very simple as to not step on a client's engineer's toes. I use a couple of nice mics and an Apollo interface (and I splurged on the Preamp plugs) into Pro Tools. I use a Wacom tablet, which makes things a lot easier, especially when editing waveforms, tuning vocals and stuff that requires small increments. It also keeps me from getting carpal tunnel syndrome.